Can I have IK bones in hands? What is the IKMakerX plugin? Creating IK bones is something that less experienced users rarely attempt, considering it rather confusing stuff. On the other hand, most new models are created with pre-made base bodies, already with bone structure that includes IK bones, so the need rarely arises. Still, there’s a particular case, one of those that often make video makers scratch their heads, wondering “Why don’t modelers do it by default?” Indeed, having an option to manipulate model’s hands by IK bones can be useful in many cases… fortunately, for this particular demand there’s an easy solution. The eoscustom3d’s translated version of PMXE (currently recommended by our Downloads page) already has the IKMakerX plugin translated as well, along with several others. If for some reason you can’t or won’t use that one, you can download the original Japanese version of the plugin from its homepage and unpack it into your PMXE’s “_plugin/System” folder. Now load your model (if it’s a .pmd, it will be converted automatically) and launch “Edit->Plug-in->System->IKMakerX”. In the panel that opens hit “Run”… and your model already has IK hand bones! Told you it’ll be two clicks! All right, if it’s so simple, you think, then why there are all these other options? There are ways to finetune your IK bones a bit. First, you can determine whether you want IK bones on both hands, or just one. Why would you want to? Well, who knows, maybe you have a model that is disabled. Anyway, all options are doubled for each IK chain. You can change which bones go into an IK chain. By default, all standard bones are already set up there, but you can create a chain of completely different bones. Simply select a bone from the list on the left — controls next to “Original Bone” fields will become hittable buttons — and by hitting these buttons you substitute respective bone names. 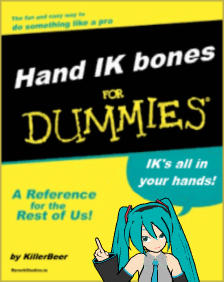 Thus, you can try to create IK bones for bodyparts *other* than hands (whatever FrankenMiku you will get as a result is not my responsibility, though). Note: if your model *doesn’t* have bones with standard Japanese names for hands, the plugin will not run. Even if you don’t plan to use the plugin on hands, your model must have them. You can change the way your IK bones will be named, if you want to. You can as well rename them later in the Bones tab of the PMXE. There are two settings that you *have* to think properly before hitting “Run”, depending on the type of the motion you have in mind for your model. First one determines whether the shoulder bone should be participating in the IK chain. Second one — whether the wrist should be aligned with the forearm during the movement, or keep its own orientation. These fields determine chain’s Inverse Kinematic parameters… you do *not* want to change them from default values unless you know much more about IK mechanics than this tutorial can teach you. The plugin doesn’t transform existing hand bones into an IK chain, the way that leg IK bones are organized. Instead, it creates duplicate bones on top of existing ones, keeping originals intact. Thus, you can move your hands *either* by moving your new IK bones or by rotating original hand bones, provided that you don’t get confused about which is which. Particularly, if you have a habit selecting bones by clicking on them in the main screen, you can’t be sure which of two bones residing in the same spot you will get. 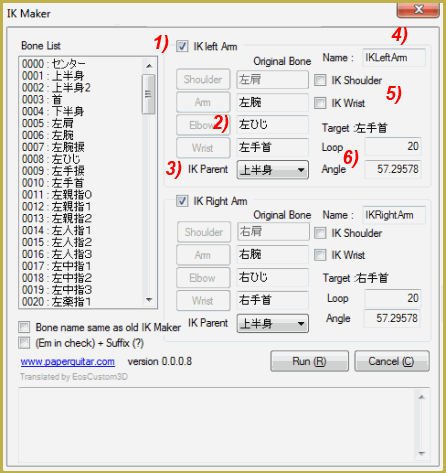 It’s better to select bones through FMP, making a distinction between original “Arms” and new “ArmIK” bones groups. Because of the above, the way your arms move may be somewhat different from what you’re used to. It may be not a big problem when you animate a motion from scratch, but applying pose and motion files made for generic models without IK bones may produce unexpected results. Better keep separate versions of same models with and without IK bones, only using former for projects that are completely your own. Now put those hands to use! Hi, I added the IK bones to my model but when I install MikuMikuDance, mmd stops working. Should I install DirectX9 for it? Well, if it only crashes when the model with updated bones is loaded and works fine otherwise, then your DirectX is probably all right. I am adding my model hand IK bone but when I turn on MMD it gives MMD Error. I’m glad you can help me (and I use 64-bit MMD). First what kind of error it is and when does it do it? If you create a project, then decide to add IK bones to a model and load the same project with an updated model, MMD will issue a warning that the bone structure has changed. That’s normal, you just agree to run with the new version of the model and keep going. Assuming that there’s some other kind of error and you can’t run MMD after that: Open the model in PMXE, select “File->PMX Info” command, run its output through Google Translate and see what errors does it find. For more precision, do so for the unmodified and modified model, and pay particularly close attention to messages that differ between versions. When I install the model, it stops working the moment.thank you for answer it. Illegal normal number: 24 | … × Bad! Please correct illegal normal. … △ alone (non-plane reference) vertex can be modified. Granted sequence order confirmation: 26 | … × Bad! (please check the bone order and transformation order). Look at the model’s Bones tab and pay attention to bones with numbers listed in the last part of the message. (You will have to rearrange them so their numbers will have to change; pay attention to red marks near bones’ parent/child fields to keep tabs on what is what). The point of the error message is that all bones should be ordered with parents always being higher than children in the list. Select misordered bones and shift them up and down using arrow buttons (or Ctrl-Up/Ctrl-Down keyboard shortcuts) until you eliminate all red marks. Also you may want to do the check on the *unchanged* model first. If there’s disorder errors as well, you better fix that first and *then* apply IK Maker (and check for disorders again) – it may be that you’ll have to rearrange much fewer bones as a result. You can read this article to understand the bone structure better.